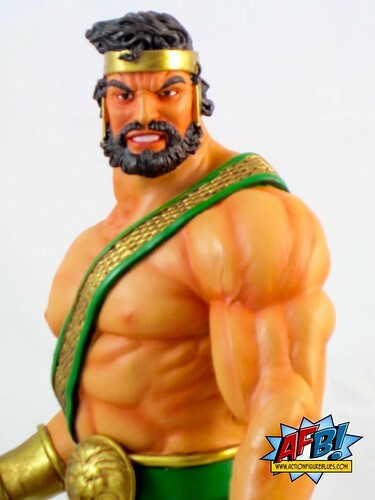 Tonight I'm reviewing the Bowen Designs Hercules Full Size Statue. This review has been a long time coming, and not just because I'm always behind in reviewing additions to my collection! Having made an interstate move just over 12 months ago, I had a period where I was looking for the best avenues for getting statues and tried out some new suppliers. Unfortunately, the site I ordered my Hercules statue not only stiffed me on the statue, but is still hedging on returning my money. A nasty story, to say the least. Needless to say it took a while for me to realize that I was going to have to find another place to buy Hercules - many thanks to Alternate Worlds in Melbourne for once again coming to the rescue. They seem to get all of the Bowen statues in and so they can often be relied on to have a recent Bowen item in stock. I was very happy to see Hercules up on their shelves when I went in hunting for them! 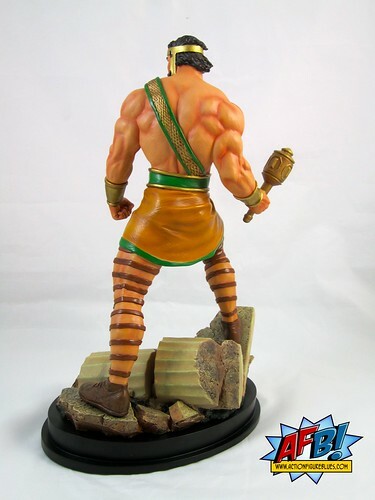 After seemingly losing a fair stack of money on my failed purchase, I might have decided not to try again with some characters, but Herc is an Avenger, and the Avengers are one of the teams that I am a completist with when it comes to Bowen statues, so I was pleased to be able to find a local option. I'm happy to report that there is nothing to be disappointed with when it come to this fabulous statue. Sculpted by the always reliable Mark Newman, Hercules stands 14" tall and casts an impressive shadow over any display shelf. He most certainly has been given the sculpting treatment worthy of a god! Mark Newman can always be relied upon to deliver an excellent piece. The pose he has chosen for Herc, with one leg raised and perched on the creatively thought out base, is magic. Some of Bowen’s newer sculptors need to take notes from Newman here - the energy lacking in some of their sculpts is present in spades here thanks to the pose and levels Newman has created. The statue gives off a majestic air that keeps drawing my eye when I walk past my display even though Herc’s been on my self for awhile now. You might think that there isn’t much to sculpt on a character that doesn’t wear much in the way of clothes, but Newman has gone above and beyond in providing detail here. Newman obviously had a strong understanding of anatomy and musculature, but the level of detail he bring to this piece goes far beyond that. Every element of Herc’s costume is sculpted, from his headband to the extensive leather boots and straps that cover his legs. No shortcuts have been taken in allowing any of these just to be added in paint. The detail in the weave on his sash is particularly impressive. The headsculpt for Hercules is simply dead on, right down to the hooked nose. This is classic Hercules in every way. He has a well defined, determined facial expression which has translated well from concept to production. The base is inventive and adds much to the statue without taking over. The crushed pillars add levels and interest, but don’t create a particularly expansive base when you consider the size that would have been required to suit Hercules’ ‘wide stance’. Nothing about the paint job on this statue takes away from the great sculpt - instead it adds to it greatly with excellent flesh tones and solid colour choices. The colours in the figure and gear mesh nicely with the sand colour of the base to create a very strong visual effect. There is some nice use of metallic paints where appropriate. All up - I couldn’t be happier with this purchase, and it was well worth the hassle and wait. Some Bowen pieces make it into my collection because they help complete a set, while some make it in because the statue looks fantastic. This Avenger ticks both of those boxes without a doubt! You can see a greater range of pics at Facebook, discuss these at the AFB Forum, and comment here at the blog to enter the February AFB Comment of the Month Contest! Am loving this statue! It has great detail and really depicts i think Herc's personality. Oh yeah! That is way cool. Even got his mace spot on! Great addition Andy! Not campy enough. 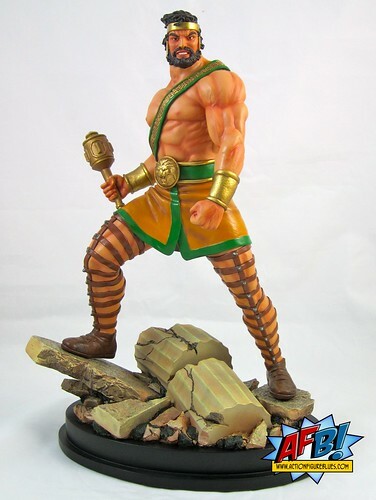 I want Greg Pak era Herc! Love a bit of Herc. Any photos of your Avengers display on the Facebook, Andy? Love to see who's represented. 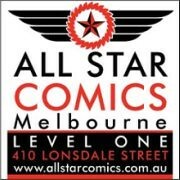 The AFB Podcast: Pimp the Podcast Contest! AFB Asks Matty for 15.2.12! It's here - The AFB Podcast Episode One! AFB Asks Matty for 1 February 2012!